Petey the Peacock harasses Eric Cantor. | 30th Anniversary Issue | Style Weekly - Richmond, VA local news, arts, and events. Long before Eric Cantor became one of the most powerful Republicans in Congress, he ran into a bit of trouble at home. 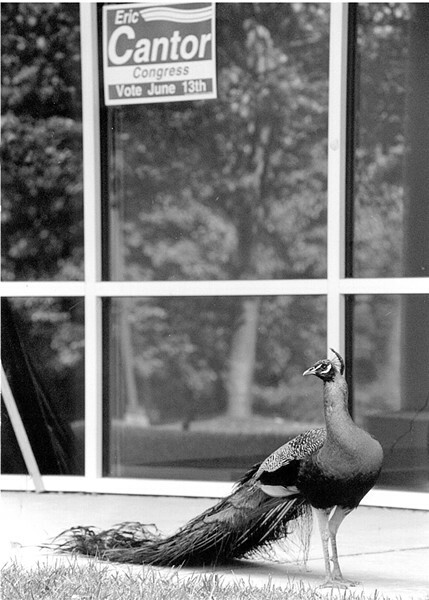 A peacock stalked his office in Henrico County, when he just a peafowl in the House of Delegates. Cantor Campaign Going to the Birds? Move over, Bucky. Meet Petey the Peacock. People at the Parham Road office building where he's taken up residence sure have. They include some pretty prominent folks, too, from Delegate Eric Cantor of Henrico to Richmond Magazine Publisher Rich Malkman. But they're not quite sure what to make of the mostly peaceful but occasionally peevish peafowl. "He just walks around making the rounds of the office building," Cantor says. "He squawks and sort of defends his territory." Petey's daily forays from an apparent lair in nearby trees have been witnessed at the Parham Trade Center since last month, when he apparently caught a case of spring fever and decided to let the world know about it. The county's animal control division says Petey has been hanging out in the area since his owner reported he had escaped last year. "There's nothing we can do because you can't get within 10 feet of it," Henrico County Animal Protection Officer J.T. Hancock says. Petey seems to detect people with penal aims, and he's not so pea-brained as to miss a free meal. "He's right below my window every day," Malkman says. "He does that I think to get fed." Cantor spokesman Jason Kello says the office has been feeding Petey bread, birdseed and water. "It's definitely more interesting than what's going on in here," he says. But there's more than a political price to pay for Petey's periodic p.m. visits, Cantor says. While Petey is "not a real menace — certainly there is the droppings situation." Food, though, doesn't seem to be the peacock's only preoccupation. "He looks lonely," Kello says. "He's sending out the call." "He's definitely got something else on his mind," says Richmond Magazine assistant editor Harry Kollatz, who describes Petey's peculiar peeps as sounding "almost like a parrot. Not like a duck." And certainly not like the GOP's elephant or Democrats' donkey. While Cantor staffers say they'd welcome Petey as their mascot, "I think he's apolitical," Kollatz says. "He's looking for a handout, but he's very proud. It's hard to tell" Petey's party preference. Cantor is running against Sen. Stephen Martin of Chesterfield for the June 13 Republican nomination for the state's 7th District seat in Congress. "My guess is that the peacock could vote, he'd support Steve Martin's across-the-board tax cut rather than a series of targeted tax cuts," says Martin spokesman Mike Salster. "Peacocks are not only pretty, they're smart. Steve Martin's tough on crime, too. He would not give aid and comfort to an escapee."